Sanal Tinned Heart Small Pet is a beautiful gift for your pet. This fun storage tin in the shape of a heart has the lovely text "Home is where my rabbit is" on it. This tin contains delicious yoghurt snacks for your rabbit, hamster or guinea pig. Sanal Tinned Heart Small Pets is a true surprise for your pet. 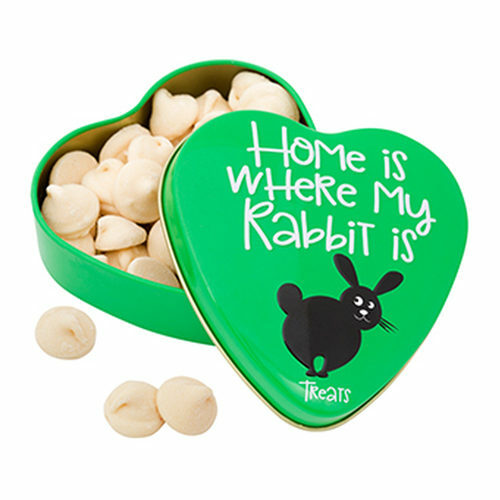 This heart-shaped storage tin has the fun text ''Home is where my rabbit is'' on it. The tin contains delicious treats that are made of yoghurt. These snacks are suitable for rabbits, hamsters and guinea pigs. Sugar, milk and milk by-products (4% yoghurt powder), oils and fats, grains, minerals. Have you used Sanal Tinned Heart Small Pets before? Let us know what you think about this product.